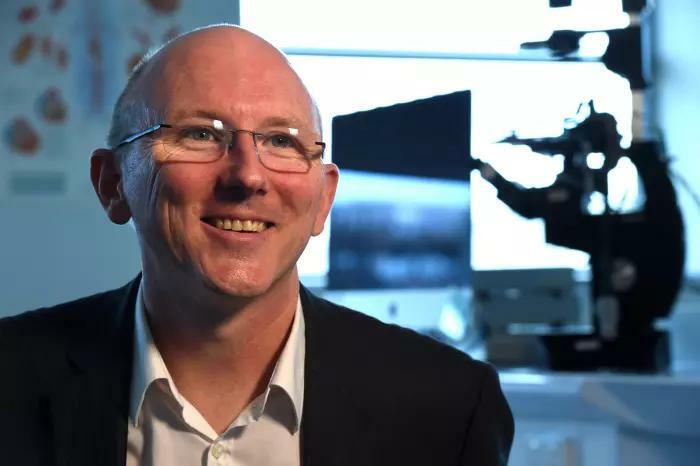 Professor Sean Grimmond is bringing groundbreaking genome-directed cancer research into the clinical space to change the way we treat cancer. I’ve been interested in science since I was tiny, but back then I had great visions of becoming an entomologist. It was at university that I discovered DNA and that was pretty much it. It totally captivated me. My Honours research was on fruit fly genetics and after that I was involved in a project establishing DNA sequencing in a lab at the University of New England. And that’s where I kicked off. A complete set of DNA is called a genome, which is essentially a packet of information that is passed on from each generation in a biological computer. The way our genetic blueprint is stored and how we pass it on has remarkable parallels to computing. The new emerging DNA sequencing technologies that allow us to ‘read’ genomes, fascinated me. I was intrigued by how a person’s DNA could be applied to interesting biological questions. By around 2006 it had became obvious that it would only be a matter of time before we would be sequencing or scripting an individual’s DNA, and this has pretty much been a theme for my ongoing research. Ten years ago we couldn’t really sequence the genomes in a group of patients in order to determine what could be contributing to their disease. But now it’s become a standard research tool, and thanks to increased and more efficient computing power, it is fast becoming a standard clinical tool. But the genome is only part of the story. Our genes drive part of our health and our disease – there are other factors as well. Anyone who has worked in genetics understands that any condition or trait arises out of a combination of G x E (Genetics and your Environment). Professor Sean Grimmond commenced at the University of Melbourne in February 2016. Picture: Paul Burston. Now for the first time, we have identified ten different genetic processes capable of driving pancreatic cancer. We were also surprised to discover that there appear to be four pancreatic cancers, rather than one. These findings were part of the International Cancer Genome Consortium (ICGC) research that Australia is part of. We’ve analysed the genetic scripts for cancers from five different tissues so far, with pancreatic cancer being the main one. Cancer is a disease of information - big data and supercomputers are an integral part of this whole process. So compiling these genomic scripts has provided us with new opportunities and directions when it comes to developing therapies and personalising treatments. One of the main reasons why people’s diseases follow a different course, or respond differently to a specific treatment, is because the underlying root-causes of the cancer can be quite different from person to person. The challenge with genome-directed research is clinical implementation. I made the move out of Australia in 2011 to accept a position at the University of Glasgow because at that time there was a very big push to transform the National Health System in the UK by using genomics. I got heavily involved for two years engaging the clinical community, working up the logistics and establishing the processes. It made me realise that with recent advances in genomics, the biggest challenge is not the science, it’s implementing it in the clinical setting. 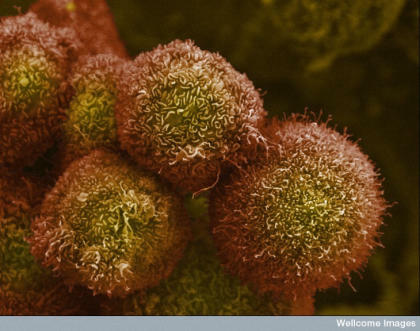 Pancreatic cancer cells. Picture: Wellcome Images. What I would like to do is set up a system whereby the pancreatic cancer work is the exemplar of how we would approach treating advanced, recalcitrant or rare cancer types in the clinic. We would need to have the means to take a full comprehensive read out of any patient data, match it back to the atlas of what goes on to the hundreds of thousands of patients and try to see how we use it to determine the best treatment for the patient. This is why I’ve come to Melbourne. The position of Director of Cancer Research at the University of Melbourne was just too good an opportunity to drive collaboration from research to clinical settings. It is very heartening to attend a VCCC tumour board meeting and be around a table with oncologists, pathologists and leading scientists all talking about how we would begin setting up trials for new drugs to target some of the discoveries we are now making. We need to be able to very accurately and very rapidly define someone’s genetic blueprint, and summarise that in such a way that is going to be useful to a clinician. You can throw a blanket over that critical mass coming together in Parkville – a powerful concentration of leading research and clinical expertise. 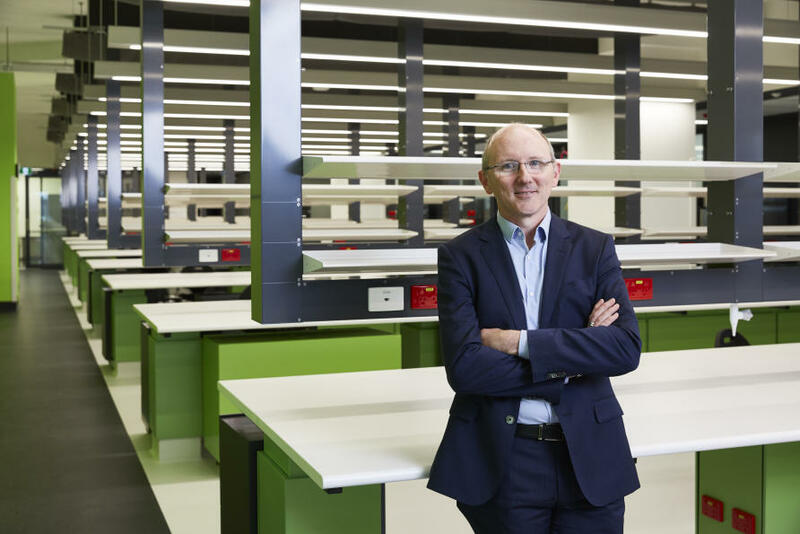 Professor Sean Grimmond moves into a newly established position to lead the cancer research strategy of the University and drive research collaboration with key partners at the VCCC which will open in mid 2016. Picture: Cameron Murray. The challenge with some genomics is that we are turning on its axis a lot of the way we think about medicine. We can’t take the traditional approach with a disease such as pancreatic cancer and try to find the best therapy that works for most people. Genomics sequencing would show us that one hundred different patients will have eighty different genetic scripts that each caused pancreatic cancer, and we would need hundreds of thousands of patients to set up randomised clinical trials for each. We need to rethink the clinical trials. The way that we currently treat patients now is with a standard care. When that fails we go to the next level of care, and when that fails we go to the next one, and then we get more experimental. But for pancreatic cancer, most of the standard care doesn’t work, and after undergoing various chemotherapies probably two-thirds of the patients won’t be well enough for another therapy. The ultimate goal for us all working in cancer research is to work towards turning cancer into a chronic disease, managed in the same way we manage blood pressure. We don’t want to keep putting people through incredible physical assaults that often prove fruitless. Taking some of the guess-work out of chemotherapy is the first step towards that goal.